Our 150 year old barn was converted in 2007 to provide family-friendly holiday accommodation for the exclusive use of up to ten people. The gite includes four bedrooms, all with ensuite facilities, an activity loft for the children and a fabulous heated swimming pool, set in half an acre of lawned garden. 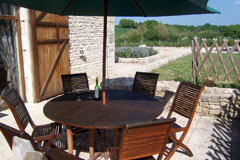 Le Mas is located in the rolling countryside of Poitou-Charentes, on the border between Vienne and Charentes. 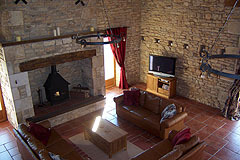 (part of the new region of Nouvelle-Aquitaine since 2016) It has been thoughtfully converted to a comfortable and spacious home, while retaining much of its character and charm. The house provides approximately 250 m2 of living space on two floors.